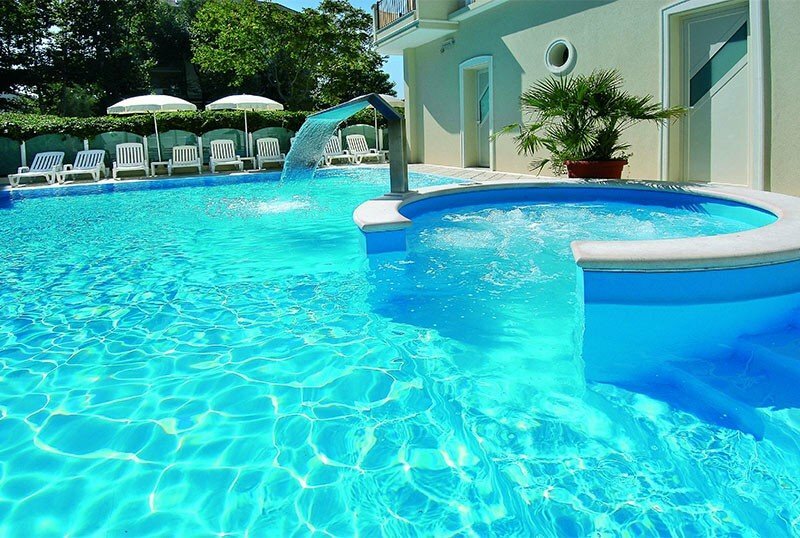 The Globus Hotel is a family-run 3-star hotel in Cattolica. It has parking, garage, free WI-FI, heated hydromassage and services for children. Guests have free access to the swimming pool with Jacuzzi, waterfall and sun loungers, located at the Cristel Residence, 20 meters from the hotel. Accepts small pets. The hotel is ideally and conveniently located on the pedestrian boulevard in the tourist center of Cattolica, less than 5 minutes walk from the beach. The location allows you to easily reach on foot both the city center and the Cattolica Aquarium both within 10 minutes walk. All rooms are renovated and have a private bathroom with shower, hairdryer and complimentary toiletries, balcony, telephone, safe, satellite TV and digital terrestrial LED, WI-FI, radio, ceiling fan, heating, minibar paid. FAMILY: available rooms with multiple beds or communicating in apartments. Equipped courtyard, sun terrace with loungers, living room with TV corner, reading room with newspapers available, air conditioned dining room, ice-cream bar overlooking the avenue of the promenade, lift, gym and multiple heated hydromassage, swimming pool with Jacuzzi, waterfall, wellness trail and cots, equipment for cyclists, free use of bicycles, laundry on request, dinner with typical Romagna theme, Sunday aperitif, evening with piano bar every week. PARKING: garage, covered and uncovered parking; all available free. CONVENTIONS: beach, amusement parks, paid shuttle service. BREAKFAST: international buffet, sweet and savory, homemade desserts, corn flakes, croissants and savory products. LUNCH AND DINNER: local cuisine with 3 menus with a choice of fish every day. all meals are followed by a buffet of appetizers, vegetables and salads. Pasta and desserts are homemade. VARIATIONS: on request vegetarian cuisine and dishes for coeliacs. OTHER: guests are offered an aperitif on Sundays, every week a typical local dinner with a dessert buffet. In the hotel: outdoor playground area and indoor corner, bicycles with child seat, children's pool (20 m from the hotel) and jacuzzi in the hotel. Strollers and bottle warmers available, on request baby sitter service, pediatrician on request. In the room: cradle, bed with side rails, fall protection rails and bath tub. At meals: baby menu on request at flexible times (vegetable soups, soups in broth, pasta with tomato sauce, baby food, etc. ), high chair, table mats. On the beach: children's playground area, baby / mini club, baby sitter, live entertainment. The hotel has a bike deposit with mini workshop, itineraries, massages and guide, catering for sportsmen, convention with specialized shop, buffet until 17.00 with supplement (in some periods of the year), laundry service for technical clothing. Guests have access to a swimming pool with hydromassage and cervical waterfall, wellness path, sunbeds and gym. The swimming pool is located 20 meters from the hotel at the Cristel Residence, of the same property. The hotel has an agreement with the Bagno n. 84 Franco and Paolo, with reserved cabins, baby club, entertainment for adults and children, baby sitter, bocce courts, table tennis and playground area. Possibility of courses Sup. Of the same property of the Globus Hotel also the Cristel Residence, located about twenty meters from the hotel and equipped with a large swimming pool with hydromassage, cervical waterfall and sun loungers, to which all hotel guests have free access. It offers well-furnished studio apartments, two-room and three-room apartments. ALL INCLUSIVE (minimum 7 days for 2 people): Full board + 1/2 lt. of mineral water and 1/4 lt. Local wine / soft drinks / beer, per person, per meal + 1 umbrella and 2 sunbeds on the beach starting from the 4th row, per room. On the walking zone, elegant, fine cuisine, every conforts, swimmingpool, fitness, heated whirlpool, wifi, parking etc. Open from 18.4 till 22.9. -OFFER from 23 APRIL, MAY, until 8.6: BB from € 26, from HB € 34, from FB € 38, All Inclusive from € 46. -FREE HOLIDAY for a child to 5 years from 23.4 to 8.6 and from 7.9 (in the rooms with 2 adults). -Advantgeux OFFER from 8 till 29 JUNE. Contact us. On the occasion of Easter and Spring Bridges come to Cattolica to discover our unmissable offers! Full board package, prices per person in a double room. 1 Child up to 2 years FREE! Offer April 25th, May 1st and June 2nd, prices per person per day in all treatments. 1 Child up to 5 years FREE! Free Holiday: 1 child 0-5 years old Free from April 23rd to June 8th and from September 7th. Special offers for Parks, Weekends, Family Discounts, Cyclists, Fairs and Wellness Holidays! -OFFER from in MAY, until 8.6: BB from € 26, from HB € 34, from Full Board € 38, All Inclusive from € 46. -FREE HOLIDAY for a child to 5 years untill 8.6 and from 7.9 (in the rooms with 2 adults). -ADVANTAGEUX OFFER from 8 till 29 JUNE, last free room. contact us. -Special FAMILY - Special CYCLIST. Parks Offer. Wellness Holiday. Special BEACH: beach umbrella included in the price until 1.6 and from 31.8. OFFER FLY AND HOTEL.